Comhaltas Dhoire may withdraw their plans to bid for the All-Ireland Fleadh in 2017 if Ennis decide they want it for another year, it has been revealed. The move would be a return favour after Ennis withdrew their bid to back Derry hosting the event during the City of Culture year in 2013. Ennis in County Clare is due to follow this year’s hosts Sligo to stage the Fleadh in 2016 and if they do bid for another year beyond that, Derry will instead put in a bid for 2018. 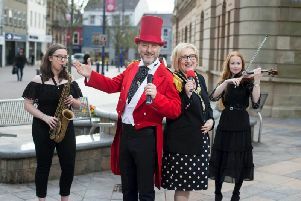 Gearóid Ó hEára, co-ordinator of Derry’s 2013 Fleadh, told Derry City & Strabane District Council’s new Business and Culture Committee that talks were ongoing with the Belfast branch, who were “very, very actively thinking” of making a bid to host the event. He said the possiblity was now being explored that a ‘two-legged’ Fleadh bid in the two northern cities year-on-year in the future was being explored. He said that in light of this the city deserved its own major annual trad festival to sit alongside the likes of the City of Jazz Festival. He added that initially the local Comhaltas branch faced massive opposition to bringing the Fleadh to Derry, and that the Derry Fleadh had probably boost around 100,000 through fear of the unknown in terms of people travelling north of the border for Fleadh for the first time. He added however that even despite this, the organisers of the All-Ireland confirmed that Derry was the largest and most successful in its 60-year history. The number one thing that came across when people stopped and asked directions for the venue, people said ‘hold on a minute’ and took them there. He added that this was by no means a done deal that Derry would secure the Fleadh in 2017 or 2018, with strong bids from among others Cork City expected. There was unanimous support from nationalists and unionists to bring the Fleadh back to the City and District, with some councillors adding a note of caution that the positive benefits of any return of the All-Ireland must be felt across the entire new council region.